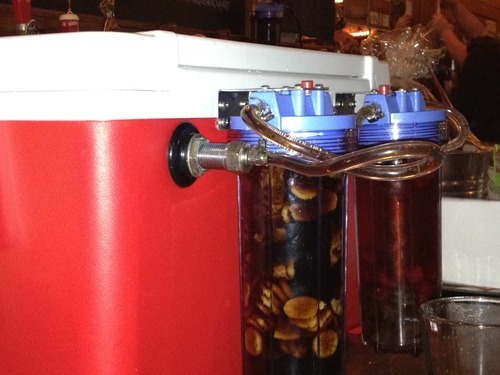 Beer News, Education, Events, & Activism. All things beer-related in South Carolina. Barley’s Greenville always puts on good events. If you have ever been there, you may or may not have noticed the eight randalls in between the taps on the first floor. Barley’s will occasionally use them, though not all at the same time. That’s why when all of them are in use, it makes for a pretty special evening. That brings us to the Drutomic Apocalypse. The event is an encore of last year, as it was such a raging success. 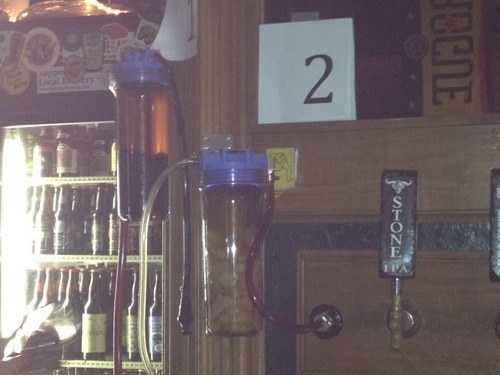 And if you looked at the beers and infusion combinations, you’d see why. This year’s lineup was posted in part prior to the event. Though, only nine of the ten beers being served were posted, which left for a little wondering what the last one would be. Barley’s is well known for bringing out special surprises that are not advertised ahead of time. Dogfish Head Black & Blue run though fresh raspberries & chardonnay-soaked French Oak spirals. Founders Breakfast Stout run through maple bacon coffee, maple syrup & bourbon-soaked maple wood chips, sweet orange peel, and bacon. Founders Harvest Ale run through pineapple & mango. Great Divide Hibernation run through dark-toasted Hungarian oak, Papua New Guinea cocoa nibs, and vanilla beans. Rogue Chocolate Stout run through rumple minze-soaked American oak and Ghana cocoa nibs. Southern Tier Pumking run through Blackbeard spiced rum-soaked pumpkin meat and Cinnamon sticks. Stone 09.09.09 Vertical Epic run through red wine-soaked American oak and lemon zest. Terrapin Side Project #18 Liquid Bliss run through banana chips and bacon. Westbrook Single Hop Citra run through wet Citra hops. As always, a few last minute changes were made. In the end, it was the Westbrook Citra that was infused with the pineapple and mango, and the Harvest Ale was cut in favor of Ballast Point Big Eye run through whole flower Simcoe and Nugget hops. Additionally, the Stone Epic was from 2007 instead of 2009. Finally, the 10th and final beer was from some Florida brewery. You probably wouldn’t be familiar with them unless you play Jai Alai. It makes for a fun game. In the end, it was a great event and a great turnout for Barley’s. Another winner for them and for the beer geeks of the Upstate. ← HAPPY SECOND ANNIVERSARY, WESTBROOK!